VCC’s fashion show was just the most fabulous show. “The Peacock” was my collection and I just like to mention about the fabrics that was used. 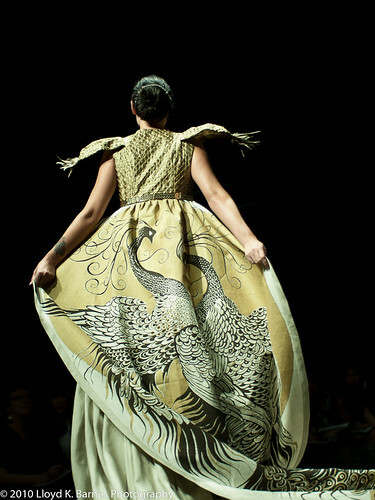 The opening piece was a print of two peacocks made by an artist in Vienna, Austria, attached to a bolero jacket of silk and pearls and feathers. Underneath is a linen dress that compliments the train. That is one of a kind outfit. The theater coat was a fabric found in Vietnam. It is one of the world’s greatest embroidery places. Hand embroidered peacock feathers out of silk. Underneath was a long dress made of 3 different silks that I shredded to make it into feathers. Too bad that it was shown only for few seconds. The print fabric I made myself. It is a batik piece with peacock feathers and crystal. It is a 3 meters piece that I draped. I hope this will give a more better insight ot the unique fabrics that cannot be found in whole Canada let alone the world. Thanks for providing more information on these beautiful and unique pieces!